We always give props to our clients and their work, so when we heard that Jens Edwards Electric had some major plans on the books, we were pretty psyched. We’ve never come across an electrician as skilled as Jens, and we’ve never met someone whose company we enjoy quite so much when it comes to a subject we take seriously. Electrical work is dangerous. And Jensie makes it all look easy. Sure, there are others who do this work, and our hats are off to them, but we kinda dig that Jens does this as a freelance operator. Granted, he is a paying client, but he’s good people beyond that. Great work doesn’t come cheap in the electric biz, but you’d rather not think about the cost of bad work. JEE doesn’t provide bad work, they’re pros. Of late though, JEE has been working on a sweet product. One we can’t disclose at this point, but it seems like a big deal from what we’ve seen. We are totally impressed and excited for our friends. In order to prep for creating promotional materials for these wares we took a peek in the graphics machine and found this, a design we put together for them a few years back. Yes, the app graphics push has died down, but we still found this to be a damned site better looking than some of the other ones out there. There is tangible beauty to great woodworking. When an object has been planned, laid out, built, planed, sanded and perfectly sealed it not only looks great, but it can finish an otherwise barren room. Great woodwork feels good. When you run your hand over the a real craftsman’s work, you can tell if it has been done right. Take a bar for instance. When a bar-front with cabinets, counter and cubbies looks great, the establishment has a more grand appeal. Sit at one end, look down the length of the bar and it should look straight, smooth and ready for a lifetime of sliding beers, supporting tired elbows and awkward social leaning. A bar has to be able to endure a potential lifetime of battery and remain looking somewhat classy. A good woodworker can hobble one together, a great woodworker can set the standard higher. We at MANVIL know a number of great contractors, and some very accomplished wood-workers. We know few as accomplished and skilled as Louis Todd. Having come from a background in construction and sundry other trades, Louis has succeeded while focusing his efforts on truly fine wood working. And it shows. We at MANVIL are stoked to call Louis a great client and friend. (whose logo we dig) We also enjoy tipping a few back with him, on some of his remarkable projects. Good tradesmen take pride in their work, and their well-performed services function for home-owners without issue for many decades. As the economy turns upward, and people around Portland begin to work on home-improvement projects, good tradesmen and their efficient efforts allow home values to rise again. As proud as MANVIL is to provide graphics for Portland’s best stone-masons, we are also happy to have Portland’s best electrician as a client. Jens Edwards Electric produce outstanding results for client’s needs, and the resulting electrical applications will remain in-tact and failure-free for many years of home-ownership. If the need for expanded electrical services arises, these stickers will lead home-owners to their home-electrical solutions. We at MANVIL were chuffed to have the opportunity to design JEE’s first graphic. We’re even more chuffed to be able to help get the word out for JEE’s future growth. 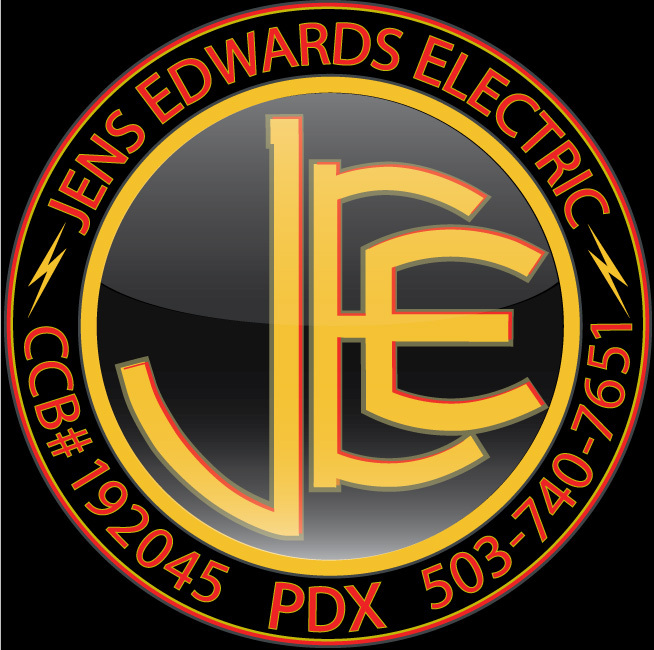 As a clean and efficient graphic, with a hint of old school and colors the client digs, we think the stickers will serve Jens Edwards Electric as a display of professional pride for many years to come. Special thanks to Kolowerx, for helping the whole thing come together. If you are in the need of an electrical systems upgrade, or any sort of electrical wiring applications, big or small, don’t hesitate to give Jens a call. Top notch electrical craftsmanship is Jens Edwards Electric’s gig. Those who know MANVIL know that for the last six or seven years (Maybe eight… OK it’s kind of a blur) we have been involved in one way or another with Portland Adult Soapbox. 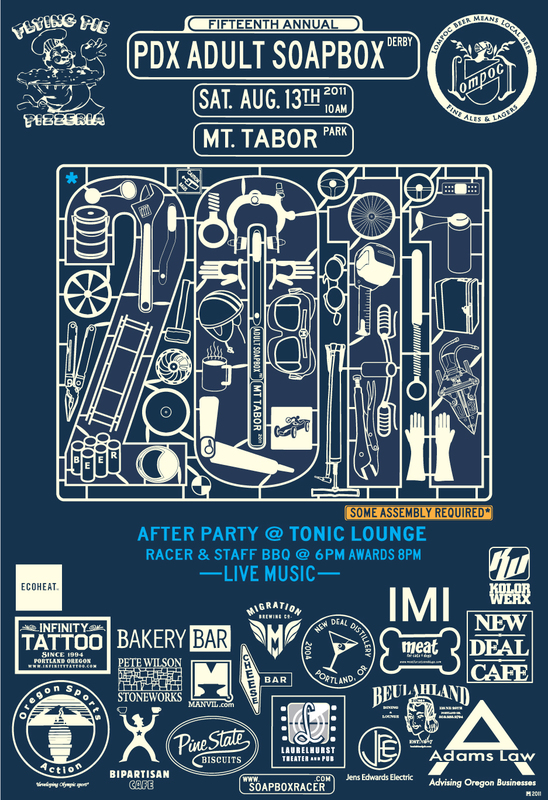 This year the powers that run the race turned to MANVIL for a little creative aid, and we were very happy to oblige. Soapbox this year is on August 13th, and the MANVIL car may be a little more prepared for the race than in years past, but that’s no fault of ours. The beer will flow the race will run and the winner, whomever they are, will enjoy a grand spectacle. MANVIL, well, we’re in it for the fun of being a part of something delightfully PDX. (And of course the full pic-i-nic basket and cooler of refreshments) Let the freak flags fly and enjoy Mt. Tabor! A special thanks goes out to the good folks who support PDX Soapbox… the Portland and Soapbox racing public at large, and especially Pete Wilson Stoneworks, Jens Edwards Electric, Ecoheat, Infinity Tattoo, Bakery Bar, Bipartisan Cafe, Pine State Biscuits, Laurelhurst Theater, Migration Brewing, Cheese Bar, New Deal Distillery, Beulahland, MEAT, Adams Law, New Deal Cafe, IMI, Lompoc, Flying Pie Pizzaria, Oregon Sports Action and Kolorwerx. Leave a comment Hail SOAPBOX!